Stop Melting Plastic Onto Your Hair! Leave hair full and bouncy with 18 hour hold. Finally, an all natural product that is safe for use with heat styling tools! Would you melt a plastic bag onto your hair? Traditional styling products contain plastic polymers which melt under heat creating an unhealthy build up on the cuticle layer, which is especially harmful to color treated hair. Contains natural holding agents derived from rice. The most effective conditioning treatment ever! Our unique HRC (Hair Renewal Crystals) compound rapidly dissolves under the controlled heat of a flat iron, infusing intense moisture into the hair shaft. The Ionic charge locks it in. The result is Incredibly Silky Hair lasting for up to six weeks. 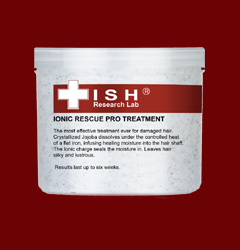 The quickest, easiest way to repair chemically stressed hair. A weekly treatment, the HRC (Hair Renewal Crystals) ingredient dissolves under heat, and is ionically sealed into the hair shaft, infusing moisture. The result is Incredibly Silky Hair lasting up to two weeks. Also contains Shea Butter, Rosemary Extract and Hydrolyzed Wheat Protein. A daily use leave-in conditioner that won't weigh hair down. Our liquid HRC (Hair Renewal Crystals) compound is ionically sealed into the hair shaft, infusing moisture and adding incredible shine. Also contains Silky Amino Acids, Algae extract, and Jojoba Oil. 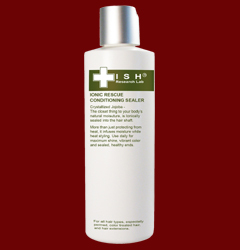 A daily use rinse out conditioner; instantly detangles and smoothes damaged hair. Our unique HRC (Hair Renewal Crystals) compound is ionically sealed into the hair shaft, providing moisture restoration for chemically treated hair. 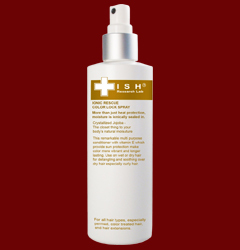 Restores moisture as it cleans, perfect for before or after any ISH Rescue Ionic Treatment. A moisture balancing shampoo, great for eliminating build up. The HRC (Hair Renewal Crystals) element is ionically sealed into the hair shaft. Leaves hair feeling silky soft, with maximum shine. Perfect for chemically stressed hair. Also contains Hydrolyzed Wheat Protein, Wheat Amino Acids, and Jojoba Oil. Our Color Lock formula provides Three Times Longer lasting color. Finally! The Sulfate-free and Salt-free natural shampoo you have been waiting for! Cleansing formula derived from coconut and chamomile dramatically prolong hair color. The HRC (Hair Renewal Crystals) compound ionically locks in hair color and moisture. Our proprietary formula provides three times longer lasting color! A must-have leave-in detangler to repair and lock-in hair color. 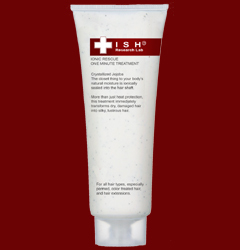 The HRC (Hair Renewal Crystals) compound ionically locks in hair color and moisture. Our proprietary formula provides three times longer lasting color!